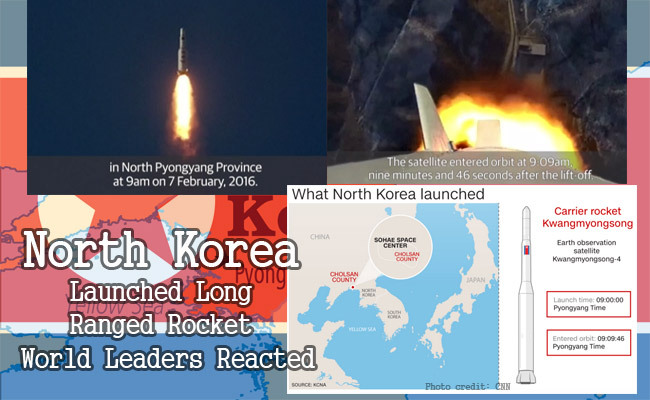 Sunday, February 7, 2016 (9:30 a.m. Seoul Time)- United States Strategic Command detected a missile entering space. According to reports, North Korea launched a long-ranged carrier rocket named Kwangmyongsong-4 from Sohae Space Center which was confirmed by KCNA. Although North Korea’s military affirmed that the launch was to put a satellite into orbit and for certain “scientific, peaceful purposes”, countries like Japan, South Korea, and U.S. were alarmed that it could be a ballistic missile test during its ongoing ban therein requested for an emergency United Nations Security Council meeting. U.N. Secretary General Ban Ki-Moon said that the launch was ‘deeply deplorable and in violation of Security Council Resolutions’. U.S. Secretary of State John Kerry said that for the second time, only in a month period, North Korea conducted major provocation, threatening Korean peninsula and United States. Japanese Prime Minister Shinzo Abe also expressed that the launch was unacceptable and a violation of the UN Security Council Resolutions. He also vowed to take measures resolutely together with international community. Furthermore, despite resistance against U.S. initiative to pursue sanctions relative to North Korea’s assumed violation, China regrets that DPRK insisted on using ballistic missile technology to carry out the launch, said Chinese Foreign Ministry spokeswoman Hua Chunying. The Kwangmyongsong-4 launch was a “complete success” according to North Korea however was disputed to be a failed launch instead. In 2012, Kwangmyongsong-3.2 was also launched to put a satellite into orbit according to North Korea but until this day, there’s no signal has ever been detected from it therefore was assumed to be a rocket missile test for nuclear warhead. South Korean National Assembly Intelligence Committee Chairman Jo Ho-Young said that aside from the weather condition, North Korea also performed the launch on Sunday to coincide with Lunar New Year (Chinese New Year) and the U.S. Super Bowl to maximize international media impact. Meanwhile, South Korea also confirmed to deliberate with United States regarding the deployment of Terminal High Altitude Area Defense (THAAD) to prepare against future drastic actions North Korea may conduct, if there’s any. THAAD is a missile carrying no warhead but relies on the kinetic energy of the impact to destroy an incoming missile.